Have you ever ridden on a roller coaster? Can you recall the thrill and excitement and all the different feelings you felt as you rode? They date back to Russian winters. Russians would go down huge wooden slides with their sleds. These slides were a big part of Russian winter fun. The French then added the train tracks, and then Americans created their Roller Coasters, with tracks and also cars where brave passengers could even go upside-down. 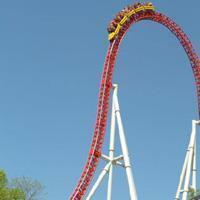 This ranking lists the steel roller coasters with biggest drops.